Herbs, perennial, cespitose, rhizomatous. Culms terete, 40-60(-90)cm, glabrous. Leaves flat, 35-70 cm × 4-9(-12) mm. Inflorescences: heads hemispheric, 10-20 mm diam. ; rays 5-9(-14), 3.5-10 cm; 2d order rays 0.5-2 cm; bracts 5-10, ± horizontal, flat, 12-40(-50) cm × 2-7 mm. 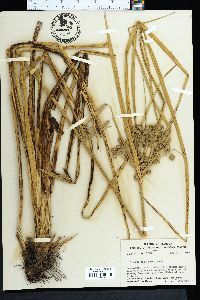 Spikelets (25-)35-50(-60), ovoid, compressed, (3.5-)5-12(-14) × 2.5-3.5(-4) mm; floral scales 10-32, golden brown to brown, 2-keeled, laterally ribless, narrowly lanceolate, 2-2.2(-3) × 0.8-1.4 mm. Flowers: stamen 1; anthers 1 mm; styles 1 mm; stigmas 0.5 mm. 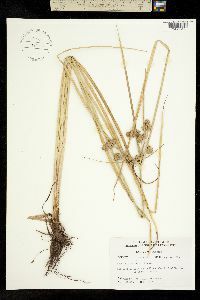 Achenes brown, stipitate, narrowly ellipsoid, 1.5-2 × 0.2-0.4 mm, base swollen, spongy, stipe 0.2 × 0.2-0.3 mm, apex acute, beak slender, 0.2 mm, surfaces puncticulate. Fruiting summer. 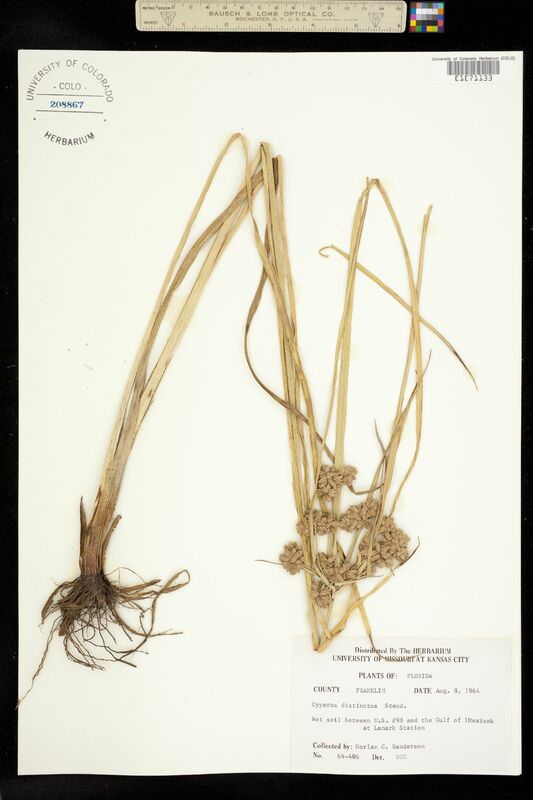 Damp grasslands, roadsides, ditches; 0-50 m; Fla., Ga., La., S.C.; West Indies (Bahamas). 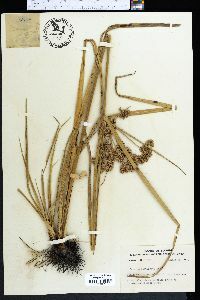 The slender achenes with conspicuously swollen bases distinguish Cyperus distinctus from other species of subg. 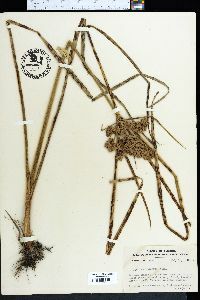 Pycnostachys.